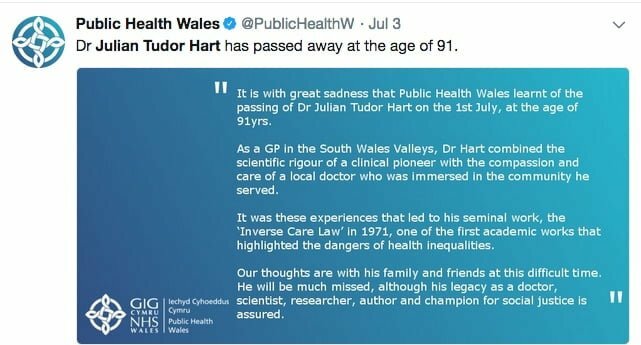 Introduction by Croakey: On the first of July, the world lost “one of the great scientists of community health”, a Welsh GP who was described as “a visionary leader who combined advocacy for equitable primary care and social justice, trenchant critiques of market influences in health care and innovative research showing how whole population approaches to improving health could transform primary care”. 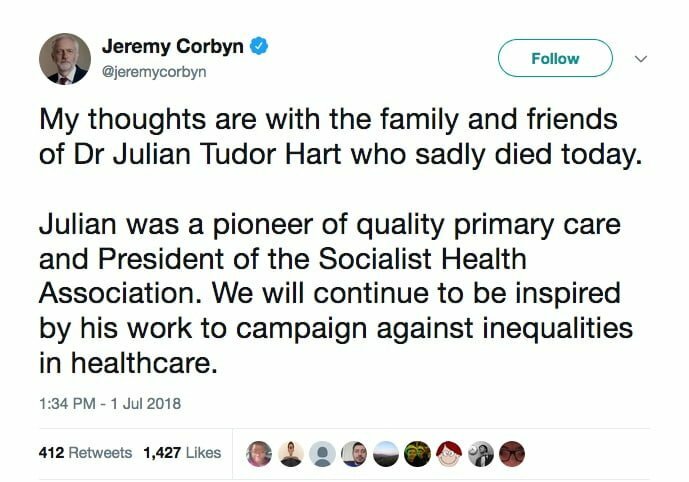 Politicians (including British Opposition leader Jeremy Corbyn), academics and patients are among those who have been paying tribute to Dr Julian Tudor Hart (see more in the tweets at the end of this post). 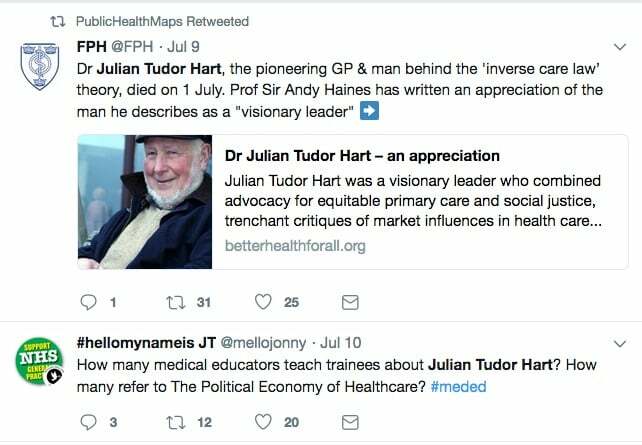 An obituary in the BMJ (paywall) described Tudor Hart as prodigious; his output included more than 350 peer reviewed papers, as well as many books – most famously, A New Kind of Doctor and The Political Economy of Health Care. 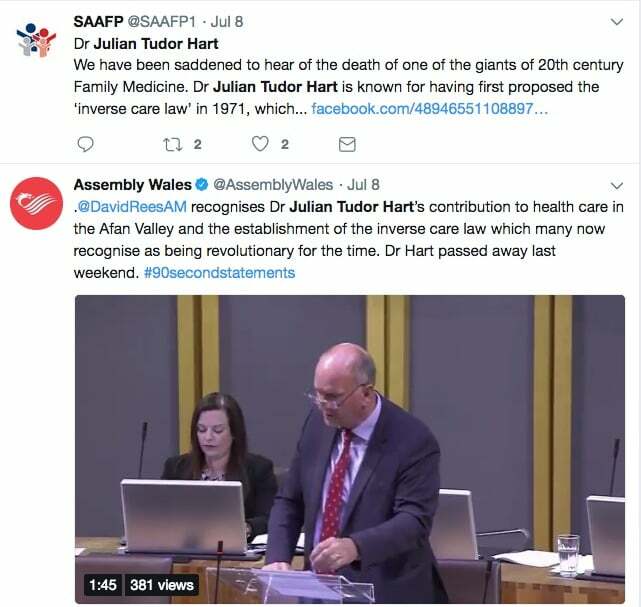 “It’s fitting that Tudor Hart, a fierce critic of market forces in medicine, should die aged 91 on the 70th anniversary of the NHS, which he defended so passionately,” the obituary said. In the article below, Dr Tim Senior, a GP and a Croakey contributing editor, reflects upon Tudor Hart’s legacy for those who work in the Australian health system. 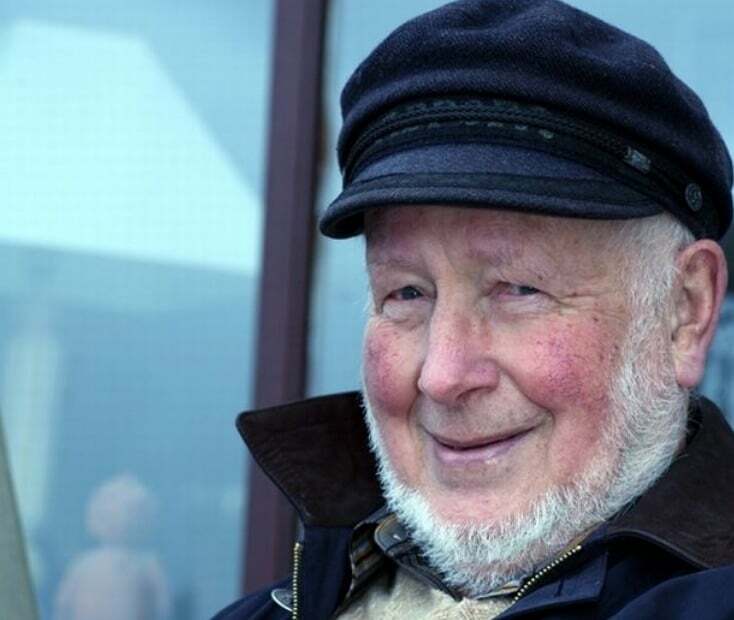 I was sad to learn of the death of Julian Tudor Hart, aged 91. 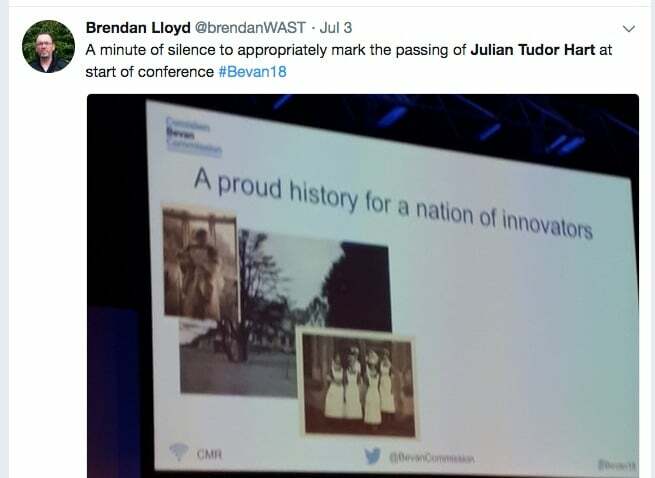 I never met him, but he has been profoundly influential on my career, in particular in being able to describe values of general practice that were able to combine excellent care of the patient in front of you, but also see them in the context of their community, and their economic and political circumstances too. Let me describe three aspects of Tudor Hart’s work that have been particularly influential for me. Any of these alone would be enough to enter him into a hall of GP Heroes. 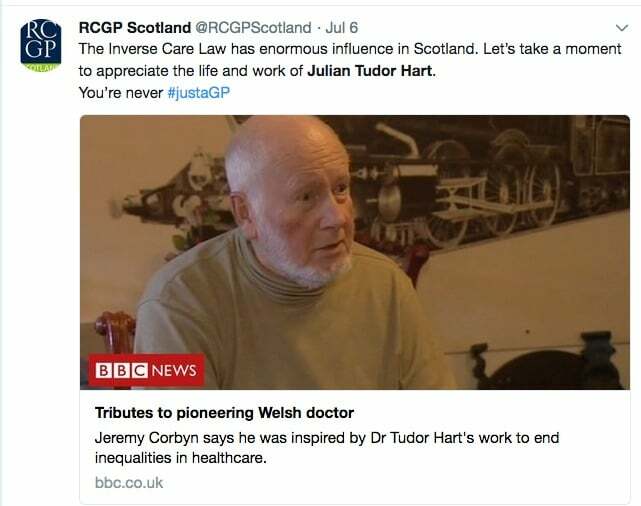 Julian Tudor Hart worked as a GP in Glyncorrwg, a Welsh coal-mining village. All his work was based on research and reflection in this community. Indeed, his practice was the first research practice in the world. 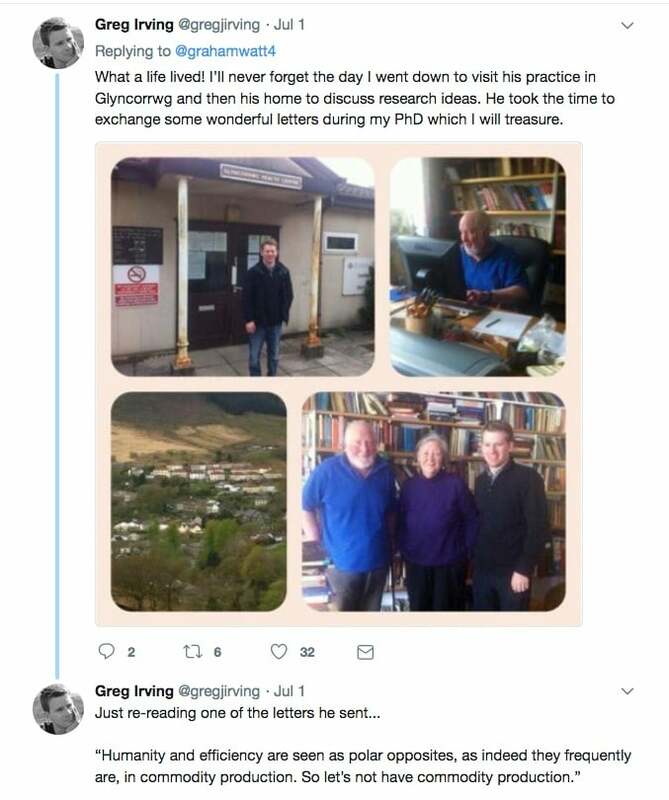 He realised that over a period of a few years he would see just about everyone in that community as a patient, presenting with some sort of illness. By doing a bit of preventive medicine at each consultation, he would, over time, manage the problems people brought to him, but also work with them on preventive interventions. Doing this, he was probably the first GP in the world to know the blood pressure of each of his patients. He achieved this without doing a single health assessment. In an approach that seems a little quaint and old-fashioned in today’s policy environment, he accepted all the problems that patients would bring, developing a long term relationship and using the epidemiology of his practice population to ensure he was performing preventive interventions systematically. This method reached 90 percent of the practice population – a figure that screening programs would be highly jealous of. These outcomes are available to us if we invest in the reach and relationships of general practice, with the resourcing and infrastructure of screening programs and invest for the long term. The original paper was written in 1971 – it’s older than me – but sadly still holds true today. It’s true at a global level – think of low to middle income countries and rich countries; it’s true at a national level – think of rural and remote Australia, compared to the cities; and it’s true at a local level – think the western and south western suburbs of Sydney, compared to the Northern Beaches or Eastern suburbs. Every person involved in health policy, public health or health care delivery needs this up on their walls in their eyeline. The Inverse Care Law is the central issue for a health system to act on. If the health of those who most need it is not being improved, then you don’t get improvements in population health. Which brings us to my third point. 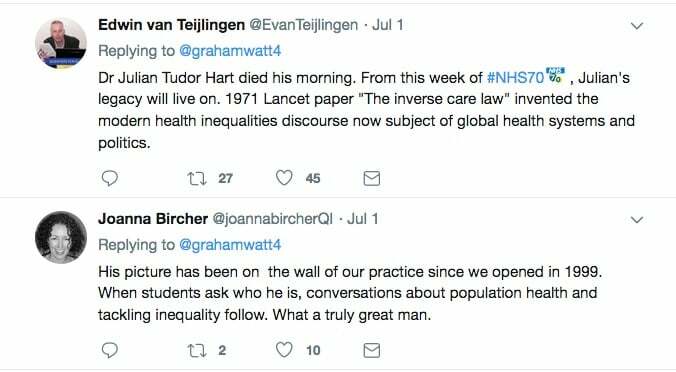 Tudor Hart’s clinical work in a poor coal mining village, and his academic work on the Inverse Care Law results in an inescapable conclusion. Health is political. He described working with patients “initially face to face, eventually side by side”. Understanding people’s context, understanding what brought them to where they were, he saw that the causes were economic, and thought that health systems were effective when they were based on co-operation not competition, were part of a gift economy, rather than a market economy. He founded the Socialist Health Association. Writing these words today makes me realise how strange this sounds, and even just using that dreaded S-word will mean some people will instantly dismiss this thinking as old failed ideas. But the truth is, we’ve never tried that sort of health system. It was nearly tried in the UK, but has been dismantled over the last few decades. There’s a chance here for Australia to move up from being merely among the best health systems in the world to actually being the best. We just need to work on improving our equity and access. This is exactly the sort of work Julian Tudor Hart shows how to do. He shows us in his clinical work in truly patient centred care, backed by good epidemiology and systems. And he shows us in his writing how health systems can work for the benefit of all of us, especially those who need them the most. No-one involved in health should get away without reading the original paper, especially as it’s open access now: The Inverse Care law. For a nice description of anticipatory care, and how it can work in deprived communities, see this paper by Graham Watt, Anticipatory care in very deprived areas. I’ve not read this yet, but it’s on my reading list! The Political economy of healthcare: A clinical perspective. There’s a brief summary by English GP and excellent blogger, Jonathan Tomlinson (@mellojonny on Twitter) here. 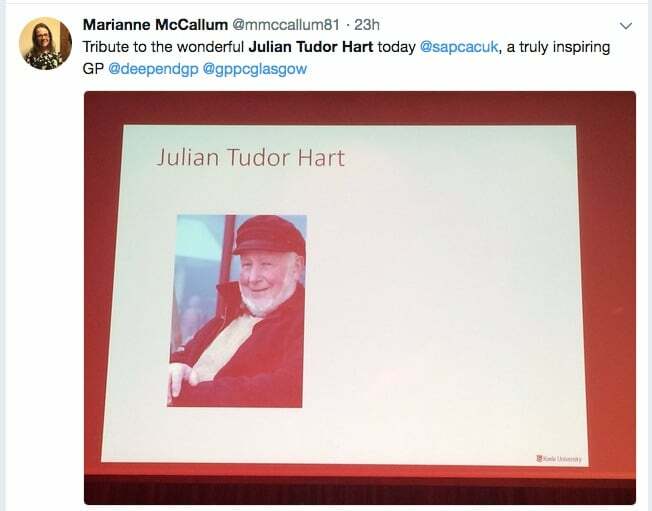 Finally, the mantle of Julian Tudor Hart has been taken up by Professor Graham Watt at the University of Glasgow (see his tweets below) and his team of GPs at the Deep End, exploring what it’s like, and what is required to work as a GP in deprived communities. This article describes Scotland, but it’s oh so familiar to my work in Aboriginal and Torres Strait Islander health. And the project continues here. • Tim Senior is a GP who works in the Aboriginal community controlled health sector and a contributing editor at Croakey. • This tribute includes audio and a transcript of an interview with Tudor Hart. • A report at Wales Online. And this seems to have been the only tweet sent by Tudor Hart. Post Script from Melissa Sweet: My PhD acknowledges Tudor Hart as a seminal influence on my work as a journalist.